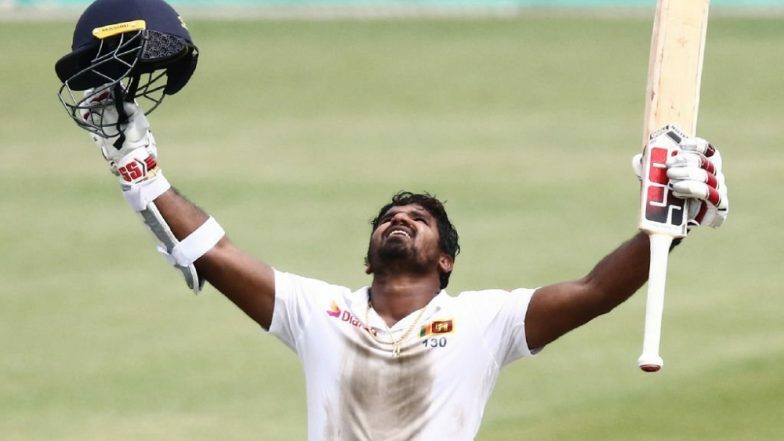 Sri Lanka’s left-handed middle-order batsman Kusal Perera helped his side pull off a 304-run chase in the first Test against South Africa at the Kingsmead in Durban. Perera scored match-winning unbeaten 153 as he singlehandedly guided his side to a famous win. Set a target of 304 to win, Sri Lanka at one-stage were 110 for five. South Africa vs Sri Lanka 1st Test Full Scorecard. Perera along with Dhananjaya de Silva added 96 runs for the sixth wicket bring Sri lank back in the contest. However, South African spinner Keshav Maharaj removed de Silva and Suranga Lakmal on consecutive deliveries to put his side back in the game. Few overs later, pacer Duanne Olivier dismissed Lasith Embuldeniya to leave Sri Lanka at 215 for eight. Maharaj then trapped Kasun Rajitha in front of the wickets and it appeared South Africa will eventually seal the win. However, at 226 for nine, Vishwa Fernando joined Perera and the duo scripted a memorable win for Sri Lanka. The duo added match-winning 78 off 95 balls for the last wicket to secure the victory for Sri Lanka. During this stand, Perera completed his century and took Sri Lanka close to the target. Fernando, who denied his wicket to the hosts, faced 27 deliveries for his five valuable runs. The majority of the runs apparently in the partnership came from Perera’s bat. The left-hander during his phenomenal knock smashed 12 fours and five sixes as he snatched victory from the jaws of defeat. With this victory, Sri Lanka now takes an unassailable 1-0 lead in the two-match series. The second Test will be played at the St George's Park in Port Elizabeth from February 21 onwards.